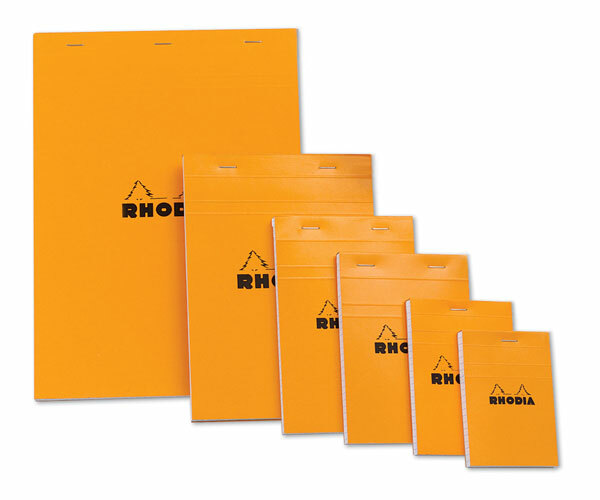 Rhodia Orange Notepads have fun, tangerine-colored covers, are available in many interesting sizes, and offer superb writing convenience. They're a favorite of artists, designers, architects and people who need quality paper for graphs, notes, sketching, and hand drafting. Graph Pads — Rhodia staple-bound graph pads feature 3/8" square violet grid lines. They're micro-perforated for quick and easy tear off. Eighty 20 lb bond (80 gsm) sheets per pad. Ruled Pads — Rhodia staple-bound pads are micro-perforated for quick and easy tear off. 5/16" violet ruled lines. Eighty 20 lb bond (80 gsm) sheets per pad. Ruled Pads — Rhodia staple-bound pads are micro-perforated for quick and easy tear off. 5/16" violet ruled lines. Eighty 20 lb bond (80 gsm) sheets per pad. Choose from 3 sizes.